Walking with a friend or spouse may help you stick to your fitness goals. This simple activity is one of the best ways to protect your heart. To start walking for exercise, all you really need is a comfortable pair of shoes (preferably sneakers). That's just one reason that this low-impact, do-anywhere exercise is so popular. But the health benefits of walking are the real bonus. Brisk, regular walking is an effective way to lower blood pressure and stave off diabetes, both of which lower heart disease risk. In fact, two large, long-term Harvard studies suggest that walking for about 20 minutes a day may cut your risk of heart disease by as much as 30%. Still, many people need some added inspiration to start and stick with a walking program. One of the best ways is to find walking buddies, says Dr. Lauren Elson, physical medicine and rehabilitation instructor at Harvard Medical School. "I find that if I can get someone to walk with a partner—a spouse or a friend—that helps a lot." Even better is getting several friends to walk together, because they all hold each other accountable. "They call each other up and say, 'Where are you?'" Dr. Elson says. For additional suggestions for group walking opportunities, see the websites from the American Heart Association (www.health.harvard.edu/walking-clubs) and Walk with a Doc (www.walkwithadoc.org). Other people find motivation by using a pedometer to track their steps and distance, says Dr. Elson, who is also the medical editor of the Harvard Special Health Report Walking for Health (www.health.harvard.edu/walk). One review of 26 studies found that people who used pedometers raised their physical activity levels by nearly 27%, adding about 2,500 steps a day. Most stores that sell exercise equipment have inexpensive pedometers. If you have a smartphone, you can download a pedometer app such as Moves, Breeze, or Pedometer++. 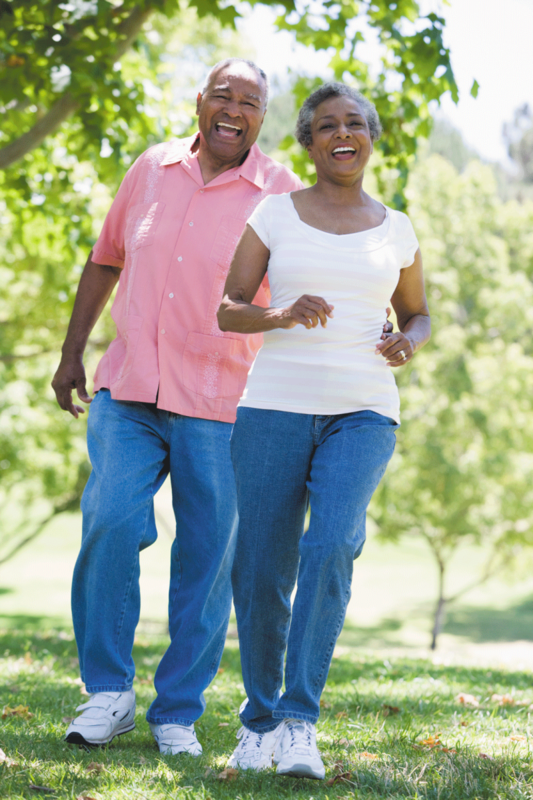 If you've suffered a heart attack or been diagnosed with heart disease, walking is an ideal exercise because you can easily adapt your routine depending on your fitness level. If you have heart failure, ask your doctor to recommend a cardiac rehabilitation program so you can safely reap the benefits of exercise. This type of supervised exercise is particularly helpful if you haven't been active for a while. Don't push through fatigue. If you feel tired or have any heart symptoms, stop. If you haven't been exercising, the eight-week workout (see "Get started walking") is a great way to begin. You'll gradually increase the amount of time you're walking, building up to the recommended 150 minutes of moderate-intensity exercise per week. That means brisk walking, as if you're in a bit of a hurry. Your breathing rate should increase, but you can still talk in full sentences. Pay attention to your posture—stand tall with your head up, shoulders down and back, and abdominal muscles tight.